The 1st Kilmore/Cavan Company took part in a cross-community project involving 5 Scout Troops and themselves, which was funded by Peace 4. The children took part in different activities and role play about World War I and the Irish Easter Rising of 1916 which underscored the importance of respect and tolerance. 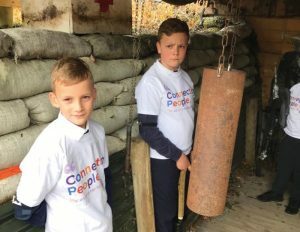 At the end of September the children acted out different parts in a WWI trench in the presence of parents, friends and the Cathaoirligh of Ballyjamesduff Municipal District and Cavan County Councils, Councillor Winston Bennett and Councillor Madeleine Argue respectively. A permanent sculpture was erected representing peace (doves) and hope (flames), part of which was made by a person from The Game of Thrones set. A super day was had by all and a great experience was shared by the children of the various communities and youth organisations.